Handmade copper house sign. OVAL SHAPE. Medium size. Size in total, including steel frame: 40cmx24cm ( 15.7inch x 9.5inch). Embossed copper plate, in a solid steel frame with hand forged steel rivets. Steel frame is thick 3 mm. Copper we use is 0.6mm thick ( 0.02inch) - it is very strong and durable, the same as for roof use. Both frame and copper are patinated , waxed and oiled in a traditional craft style, we do not use laquier that will crack over time. 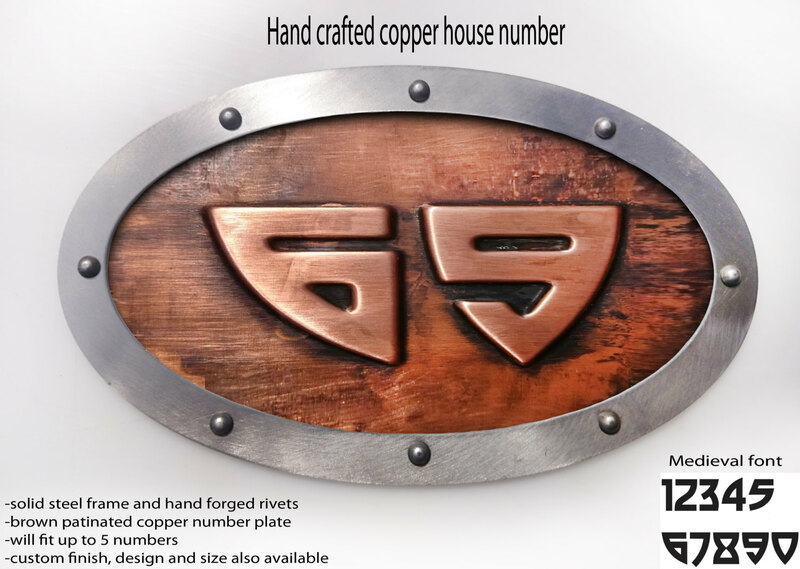 This sign will fit up to 5 numbers, you have a choice of 4 different fonts as on the pictures above. Ready to post within 5 working days. We use National Post trackable service. It takes 3-5 working days for delivery in EU countries and 10-20 working days to USA and Canada. Custom finishes, designs and sizes also available. Different patinas, copper rivets, other steel frames shapes etc.